Poliziano inn is the right choice in Rome. Located in the center of the city, near the Brancaccio Theater and the Sta Maria Maggiore church as well as Termini the main train station. It is also near both the A and the B metro lines, which will allow you a very easy and fast transportation to all the main attractions. We have a very friendly and helpful staff which is always available to give you all the information about the city. 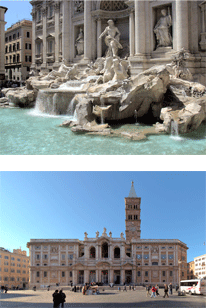 Our goal is not only to make you love our B&B, we want you to love the eternal city too. Poliziano inn has no lock-out and no curfew so you can enjoy Rome by night.